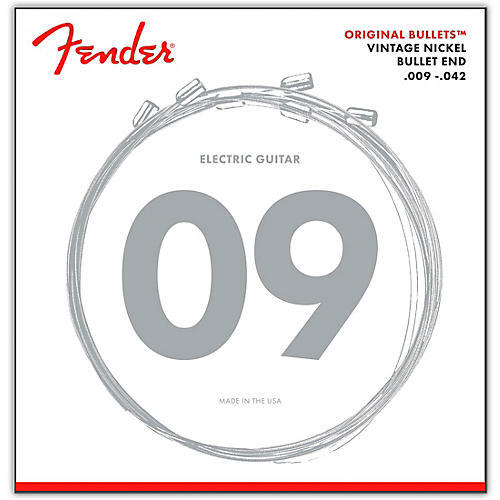 Original Bullets Vintage Nickel Bullet End electric guitar strings deliver a smooth feel with reduced finger noise. The tone is rich and warm with abundant harmonics. Fender's patented bullet end creates a sonic coupling between the string and bridge block, for rock-solid tuning stability and increased sustain. These guitar strings are perfect for blues, jazz, and classic rock. Fender has been an instrument of choice for many of the greatest musicians since 1946. Fender's popularity through the generations is a result of their design innovations and commitment to quality. These replacement guitar strings reflect this legacy and are worthy of the Fender name. Attention to detail and the finest materials ensure that you will get the best feeling and greatest sounding strings, set after set.